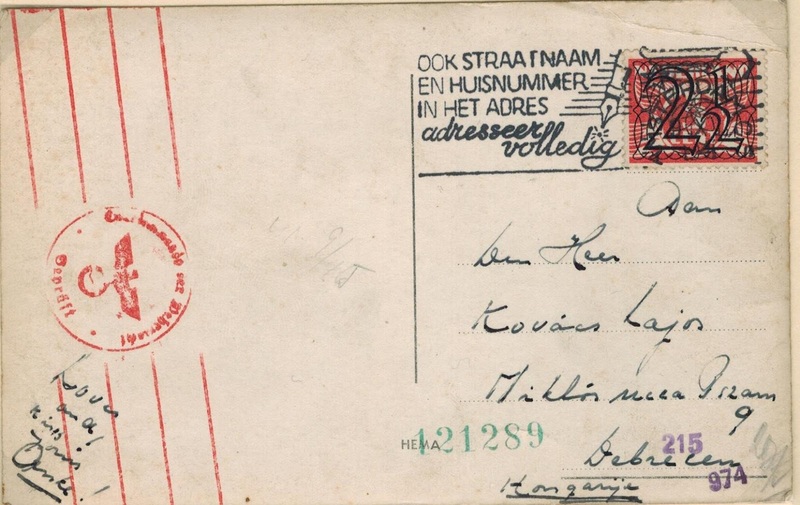 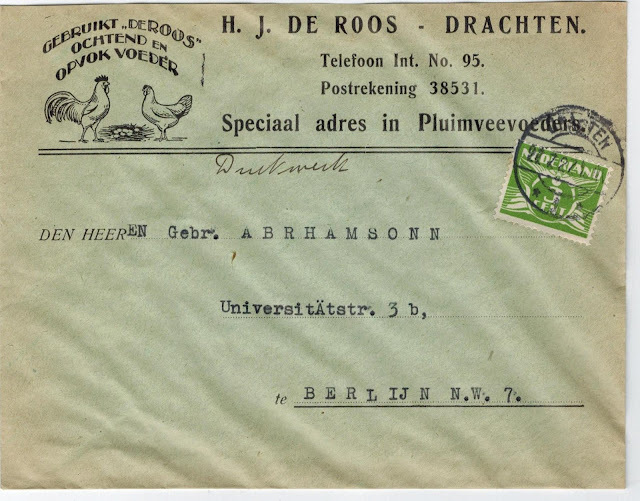 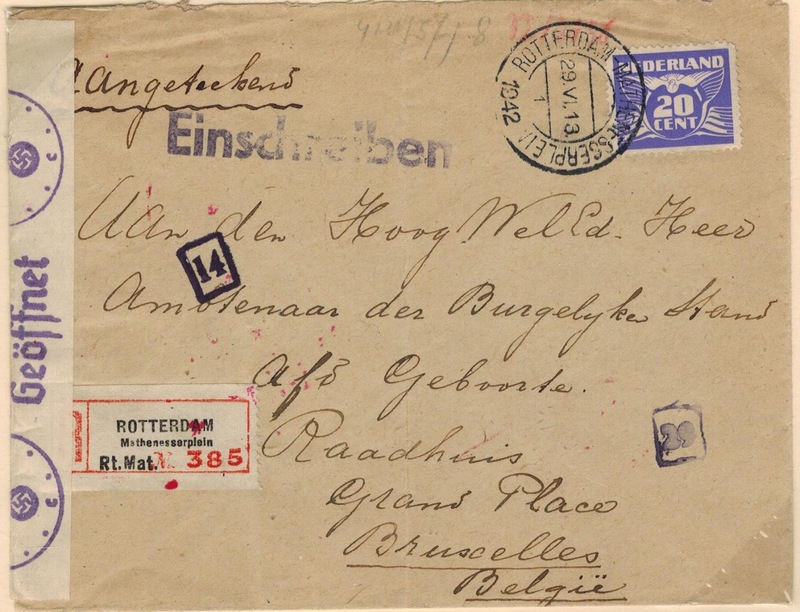 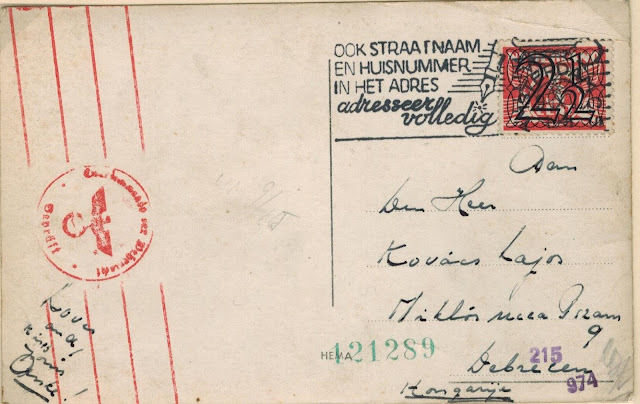 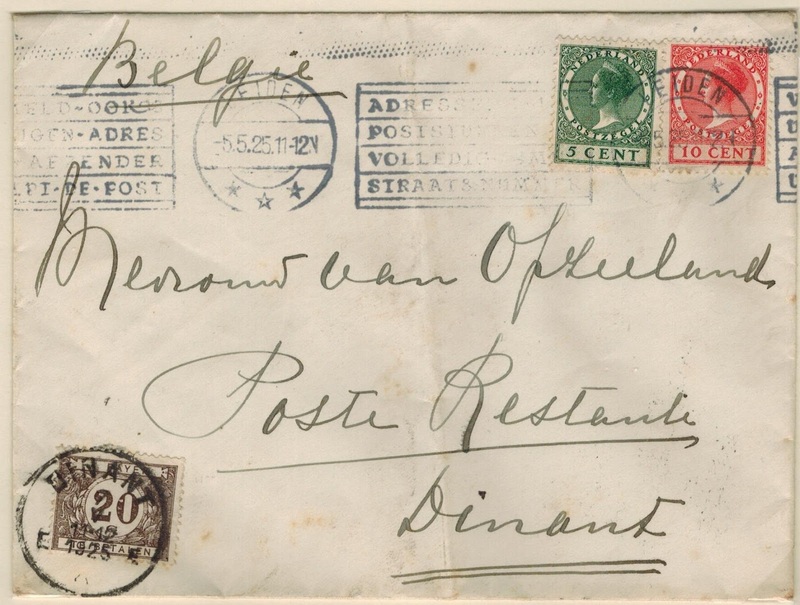 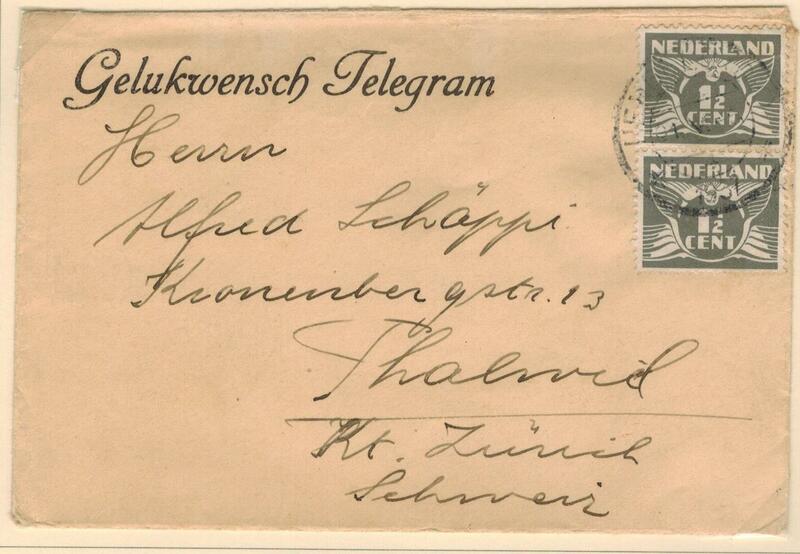 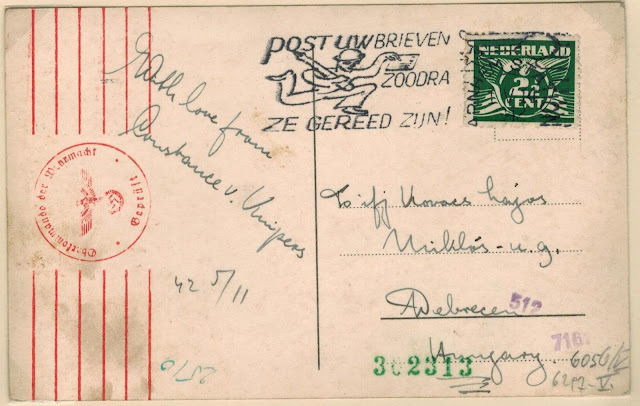 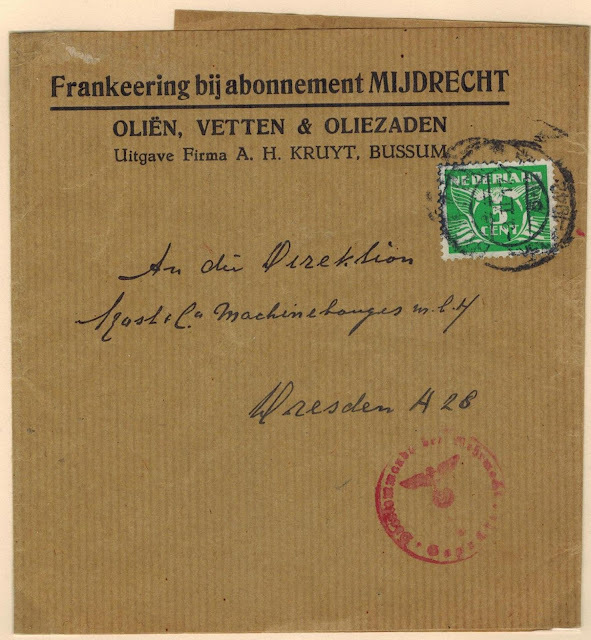 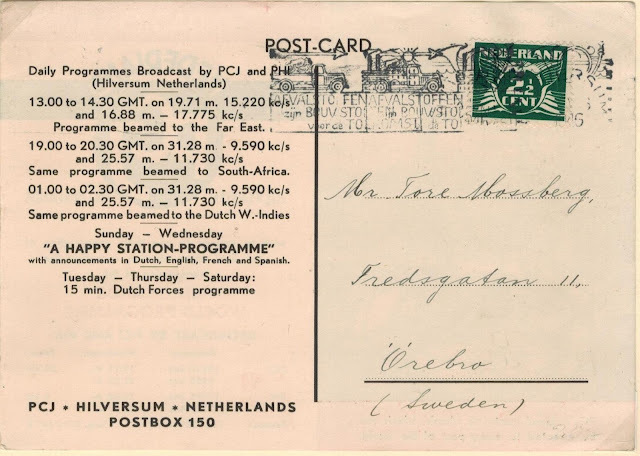 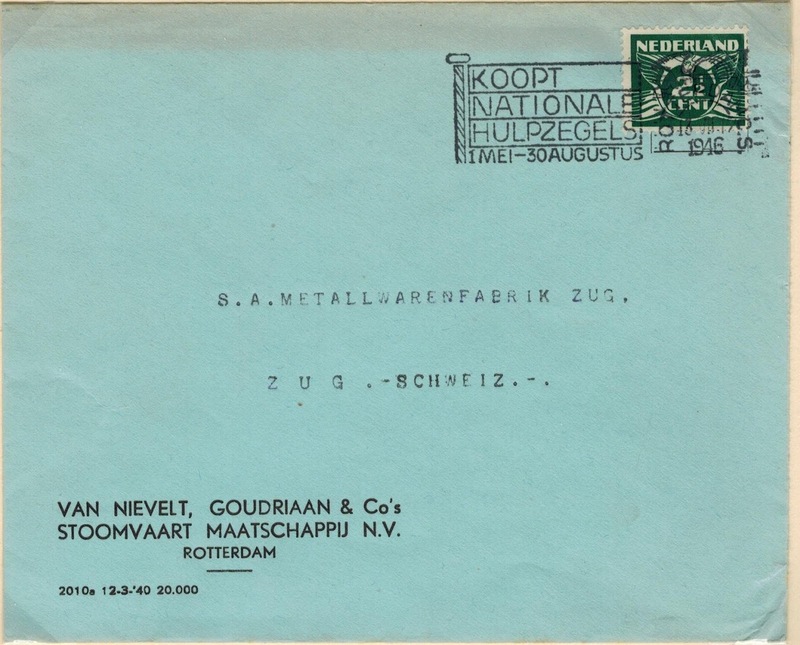 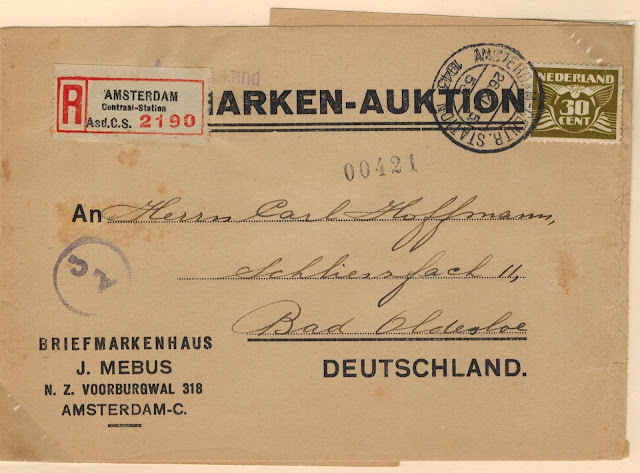 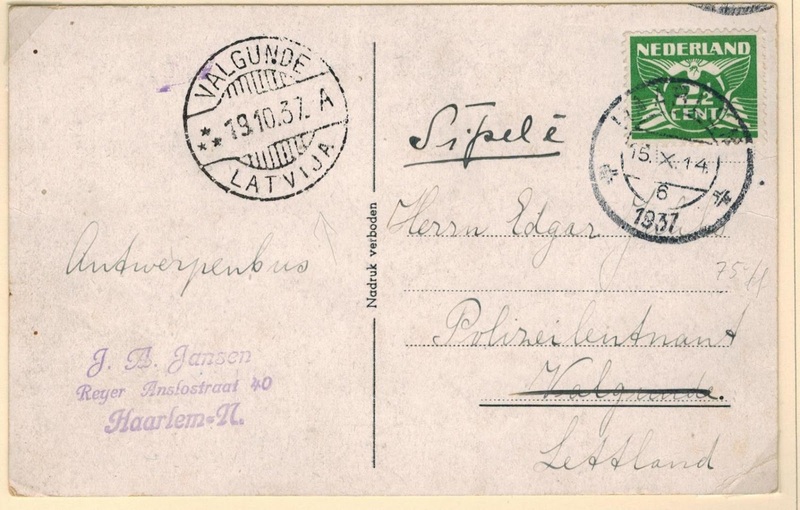 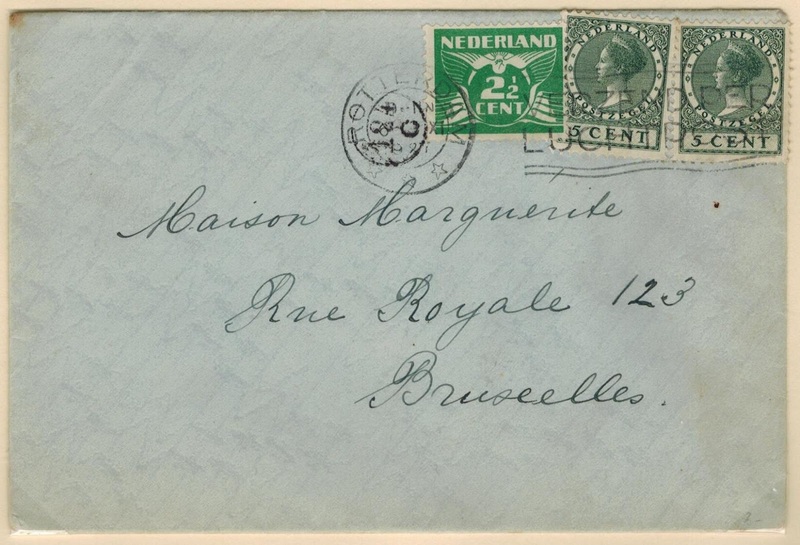 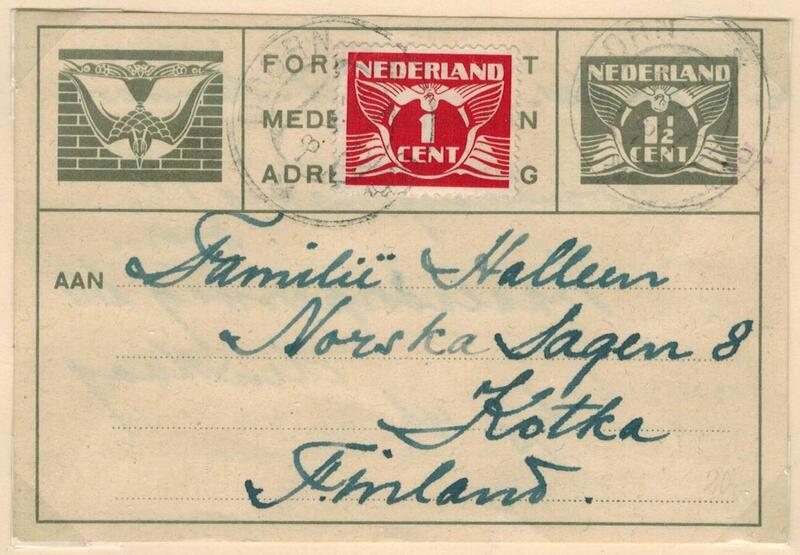 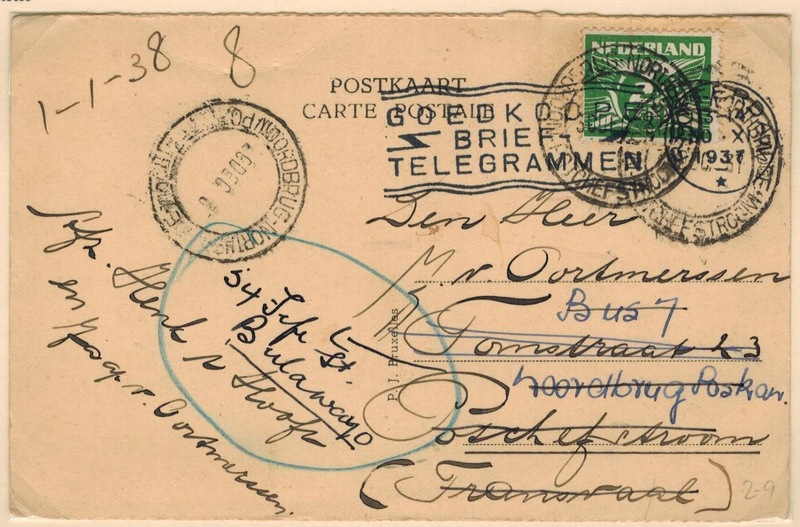 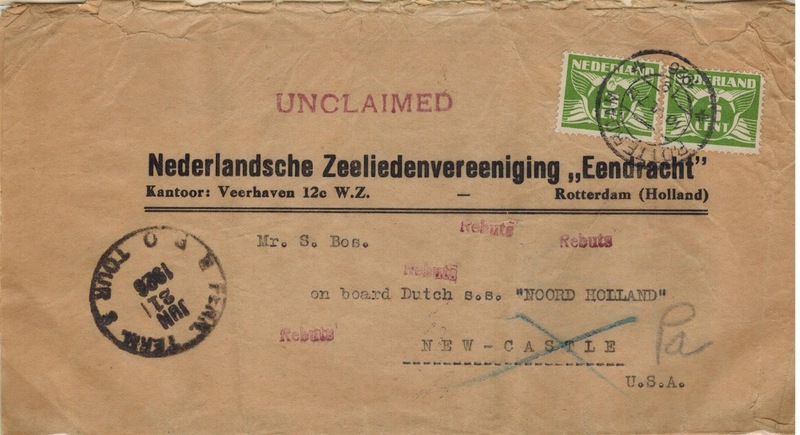 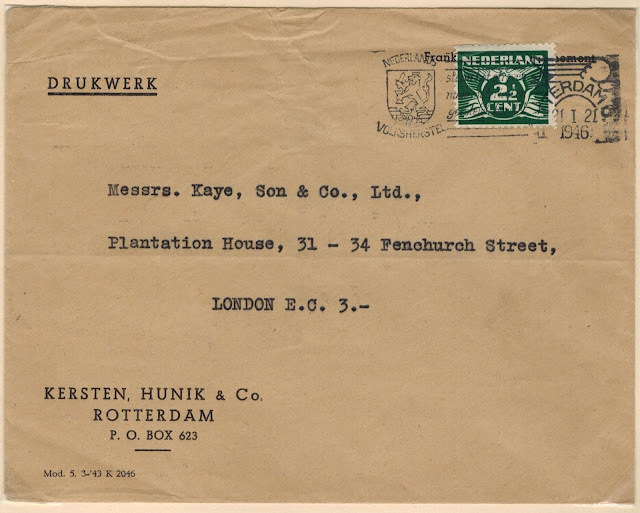 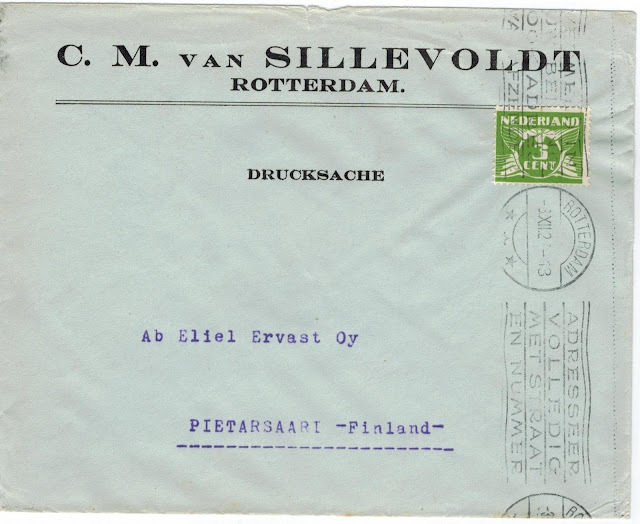 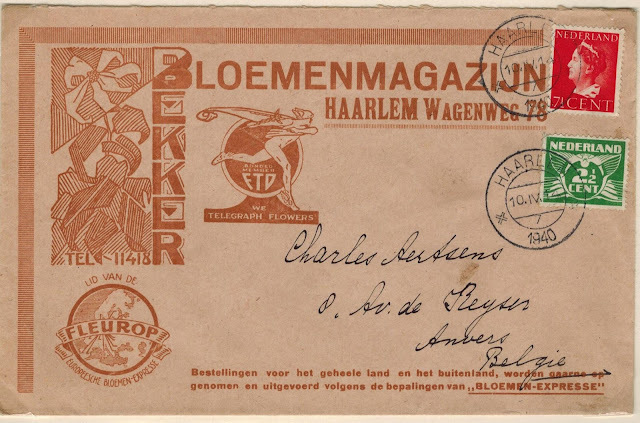 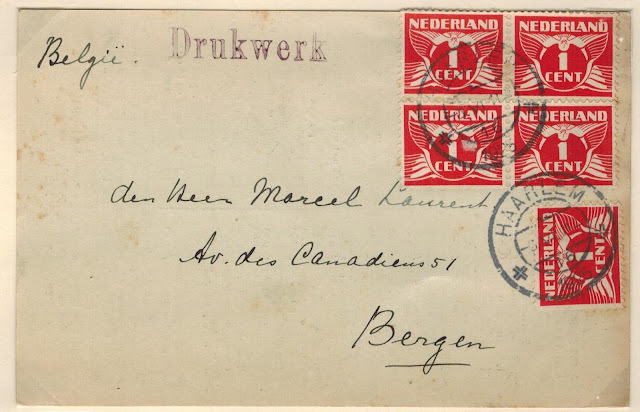 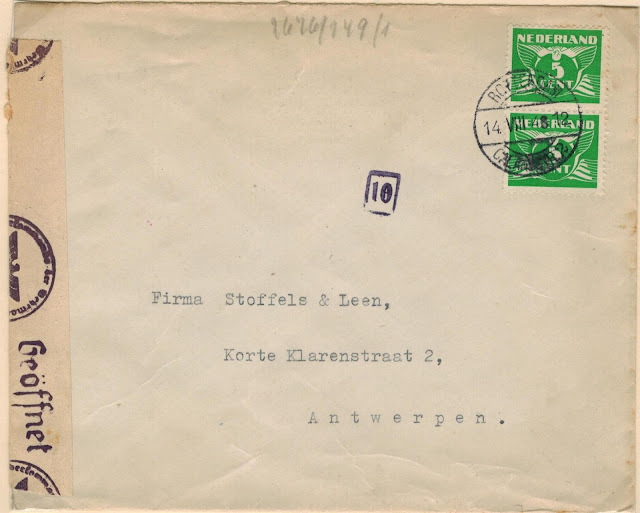 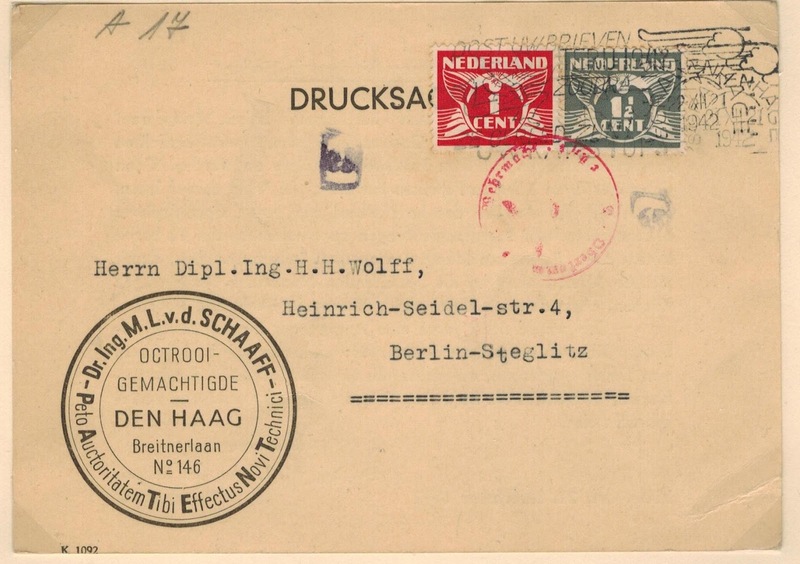 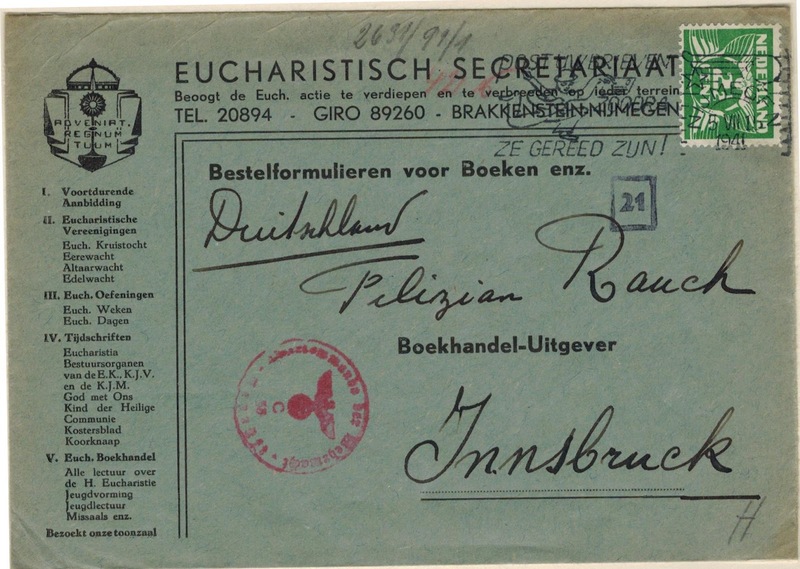 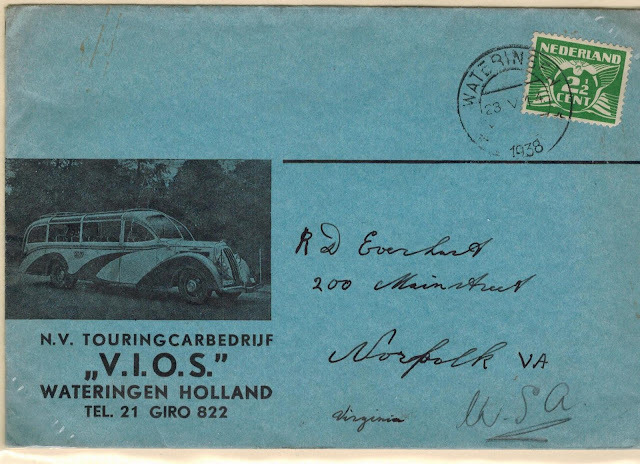 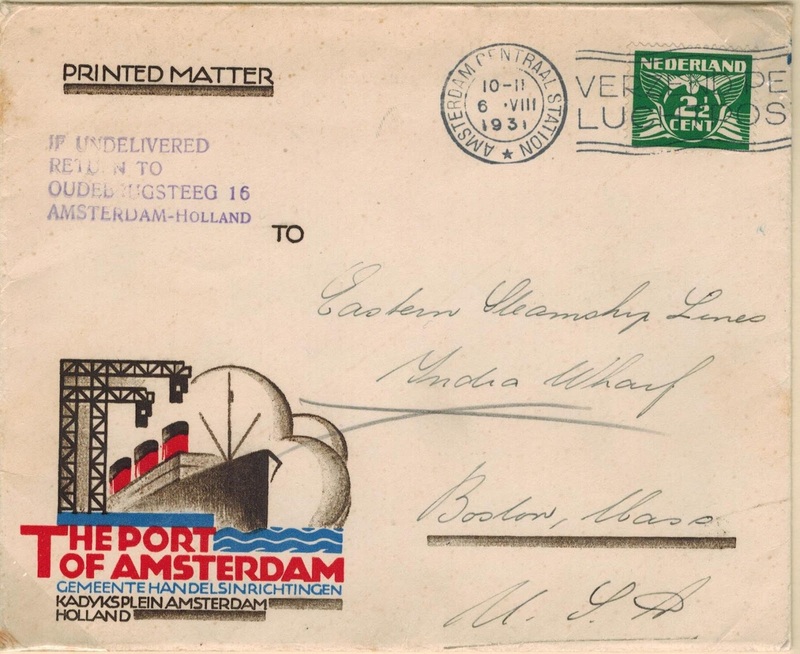 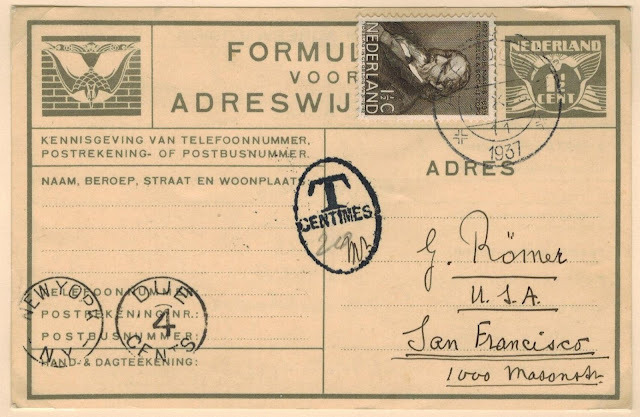 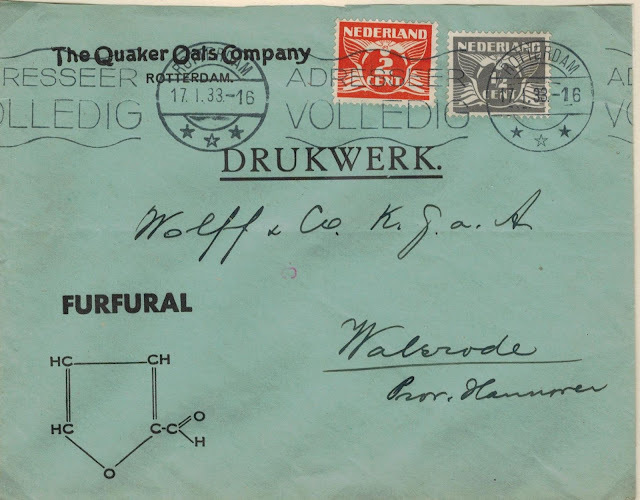 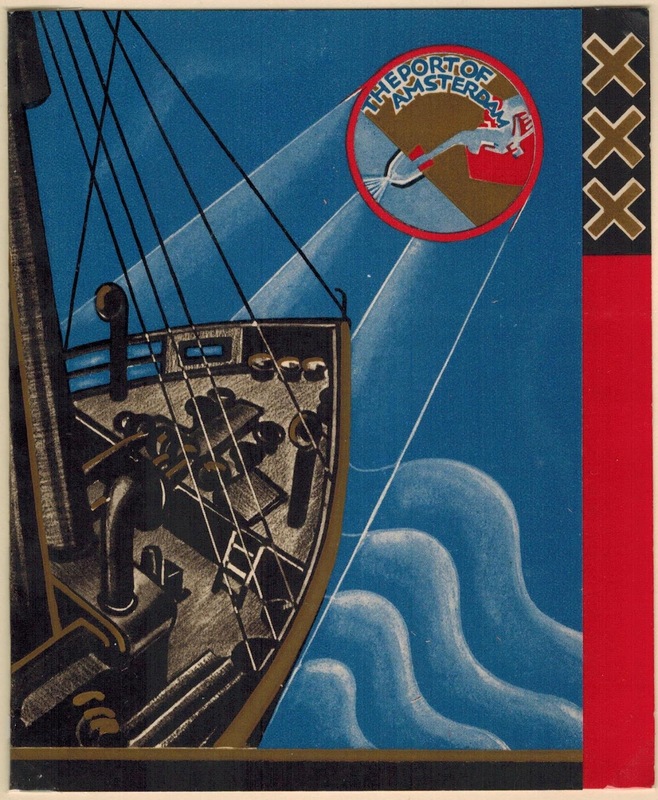 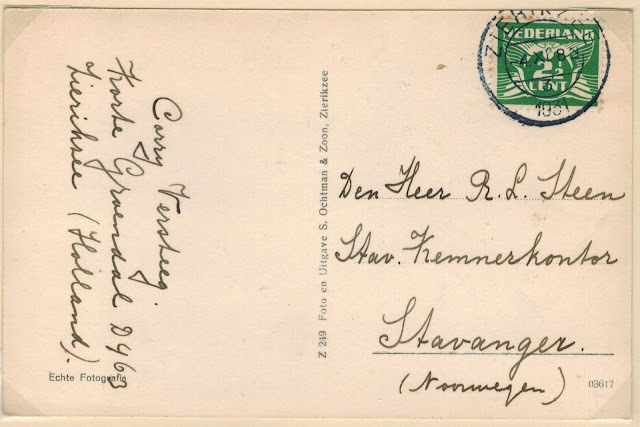 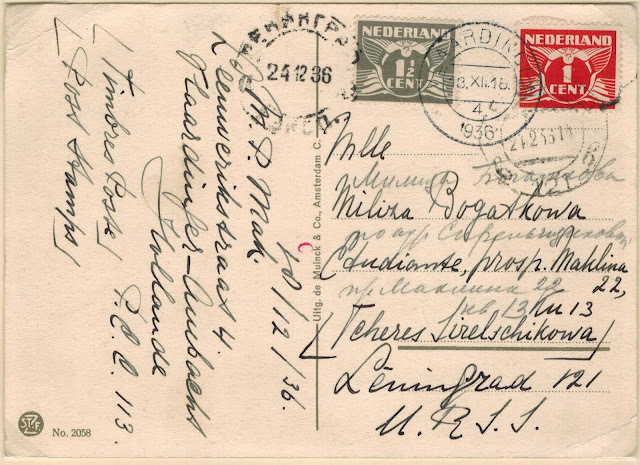 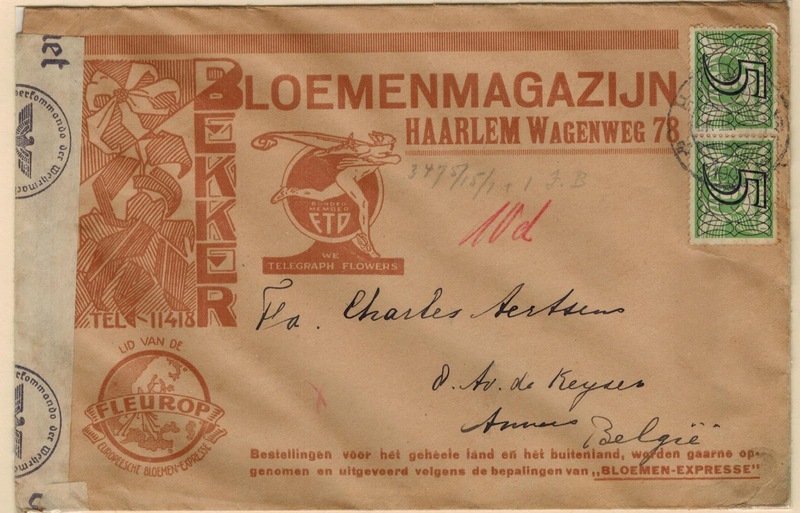 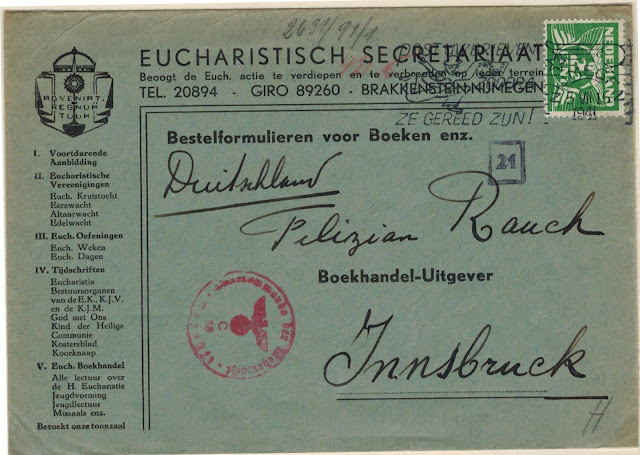 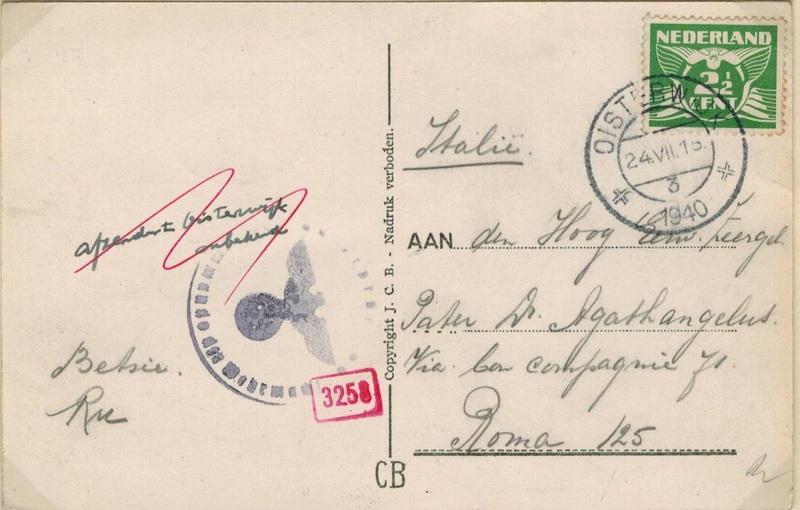 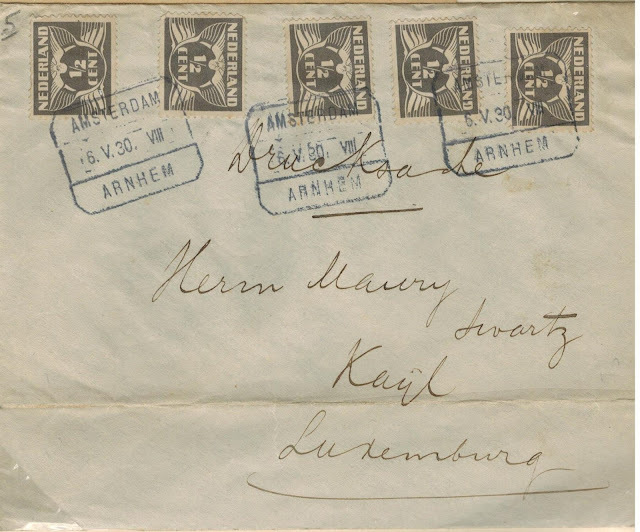 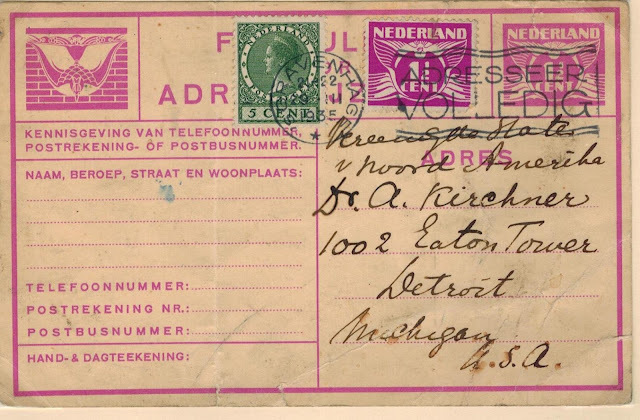 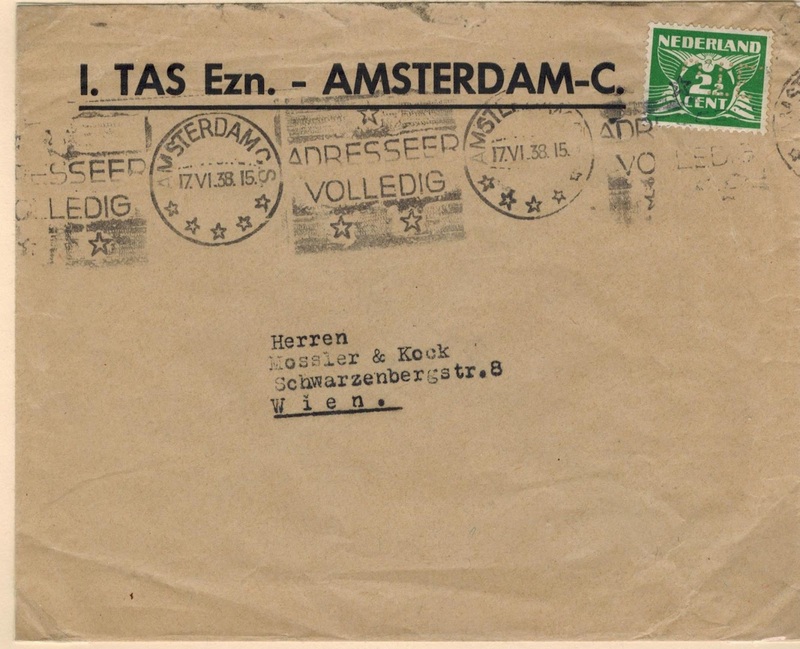 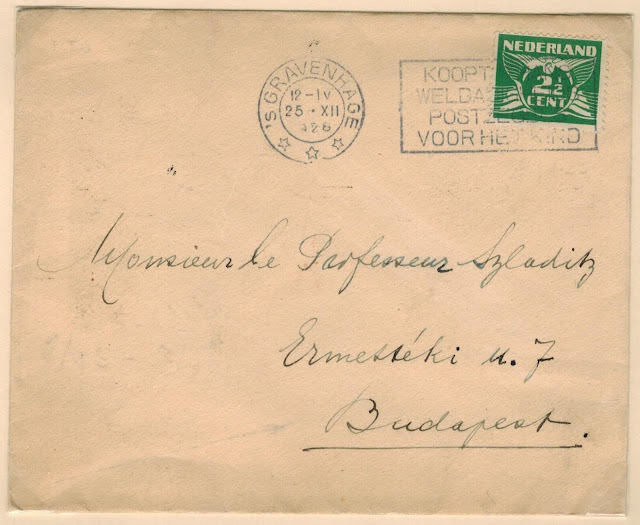 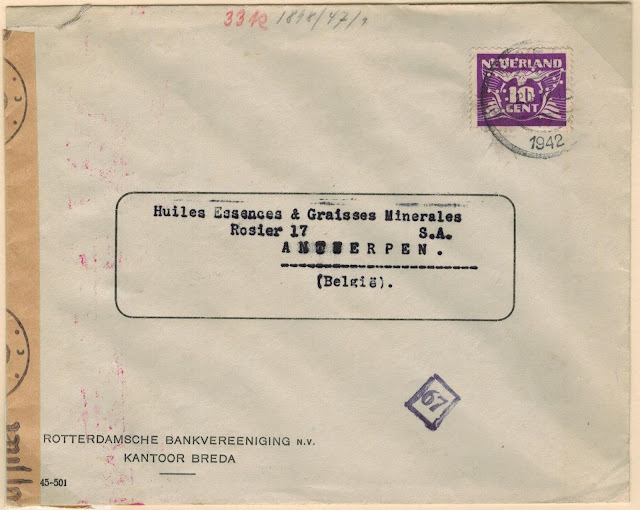 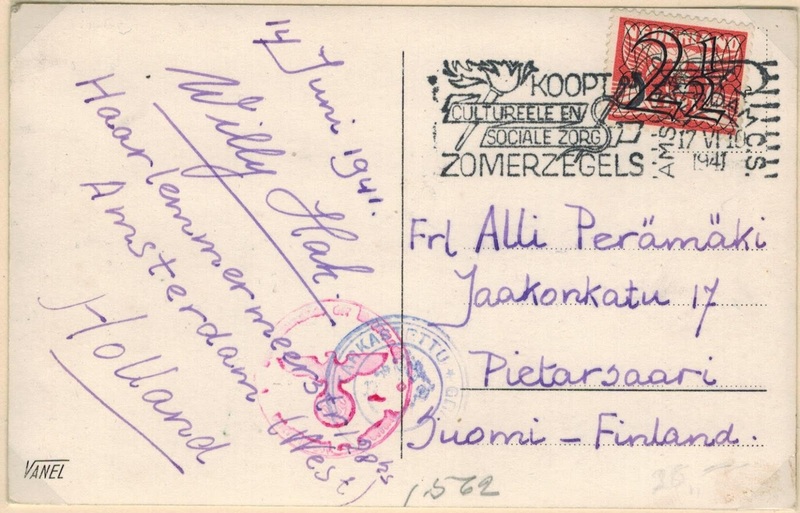 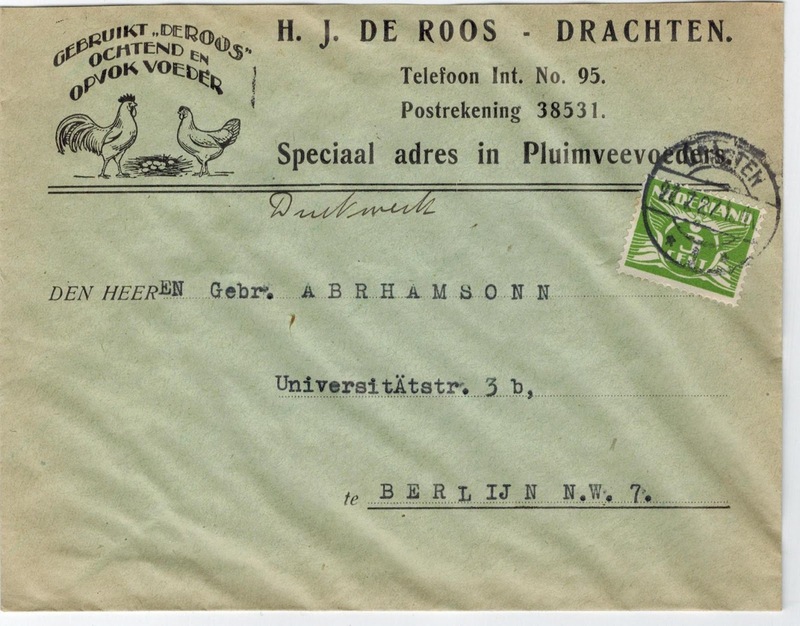 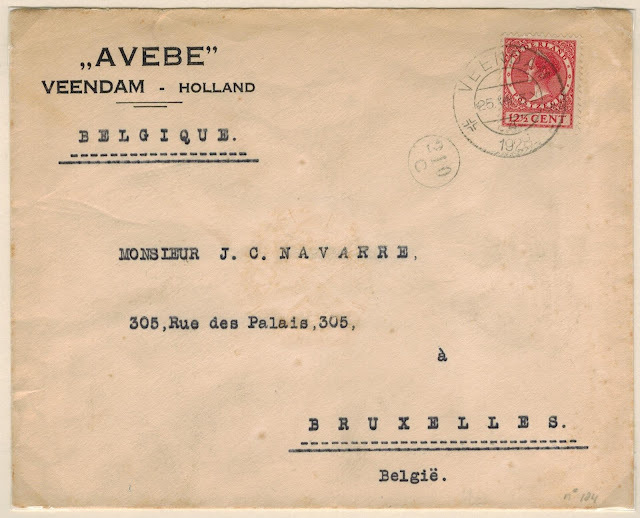 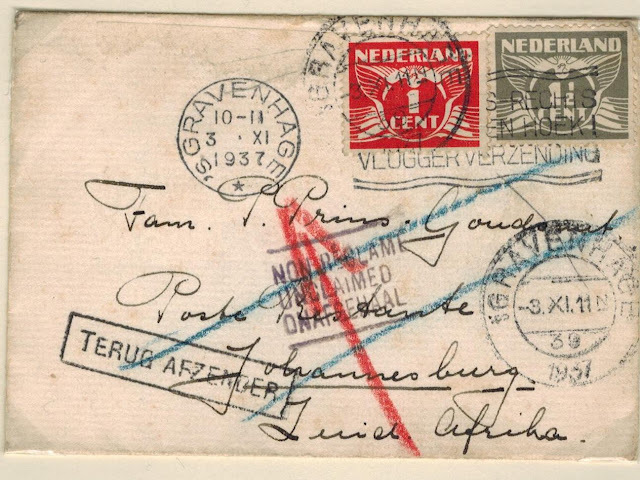 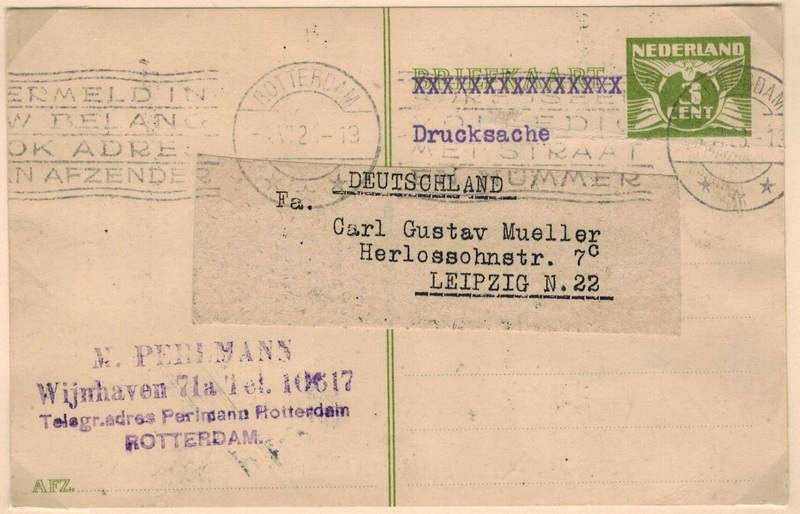 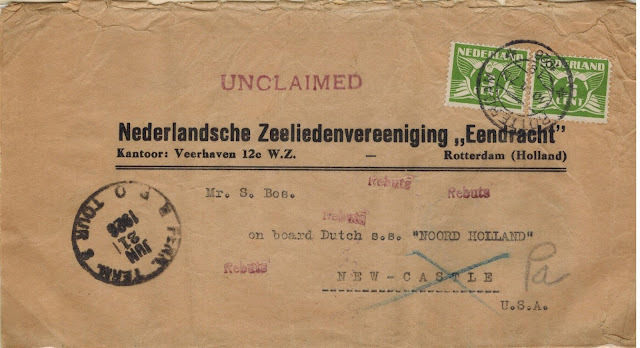 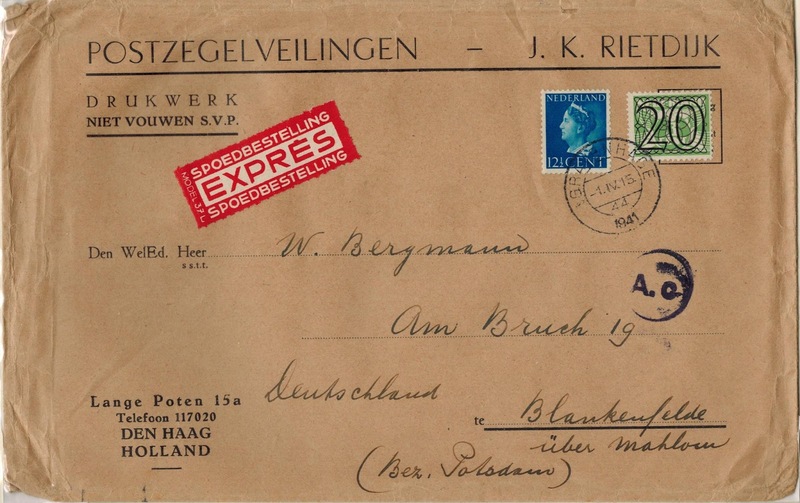 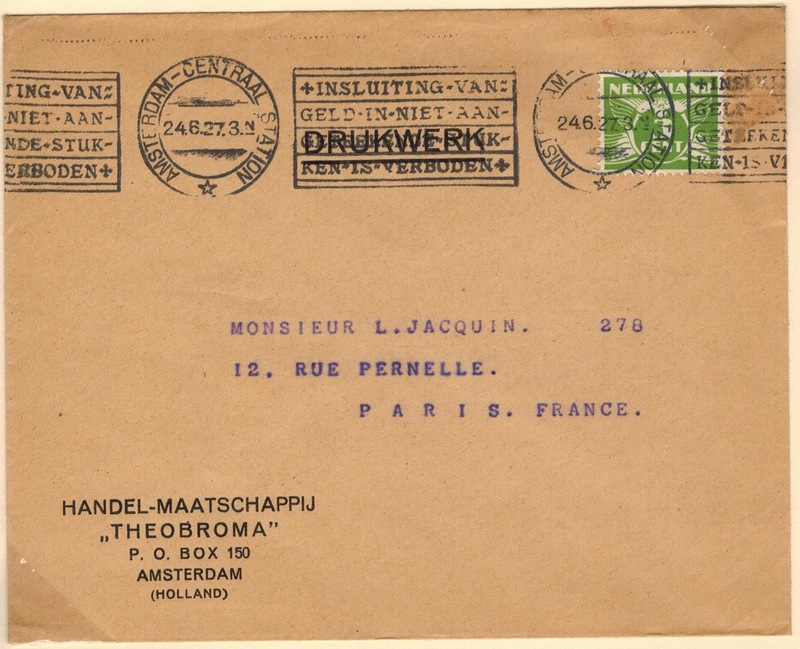 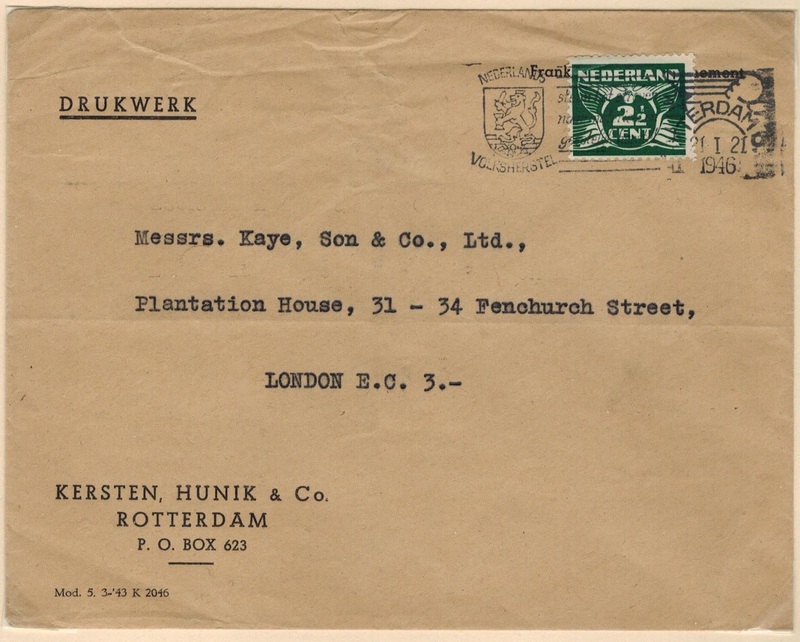 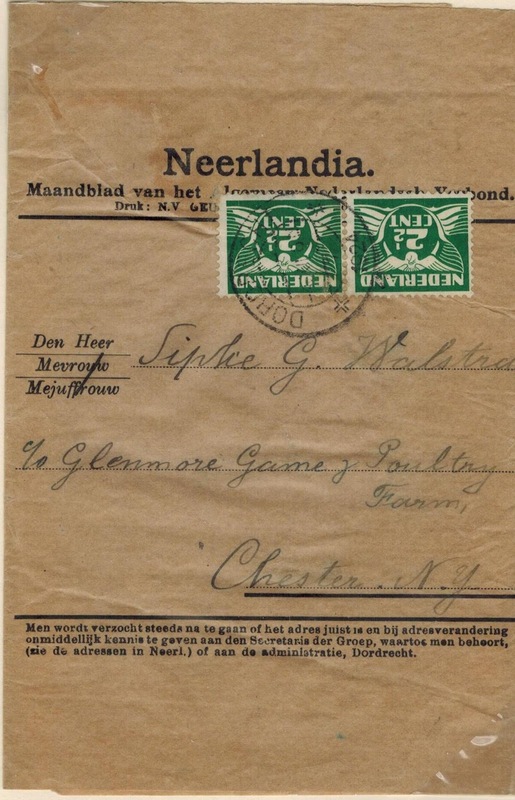 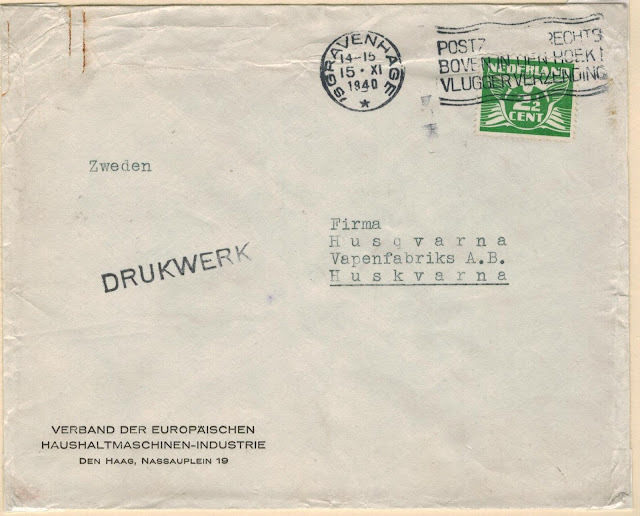 The Netherlands Postal History site deals with all aspects of Dutch postal history from 1924 to 1946. Please contact me at philcovex@gmail.com if you have any questions or comments. 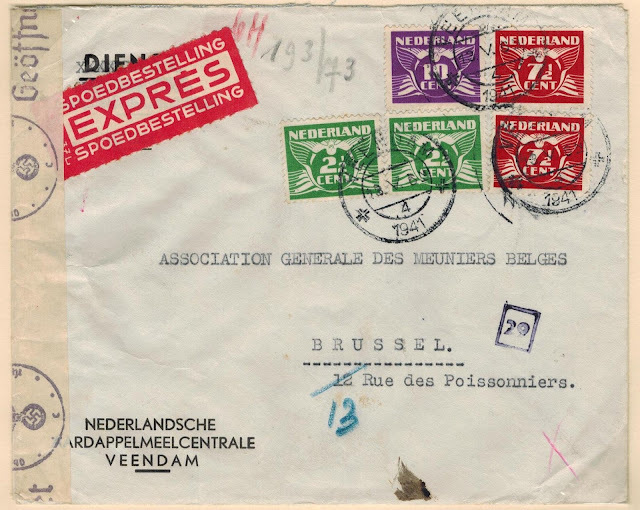 Since 1875, the first weight letter rates from the Netherlands to neighbouring Belgium were less than the rates to other foreign destinations. There were no reductions for other classes of mail. 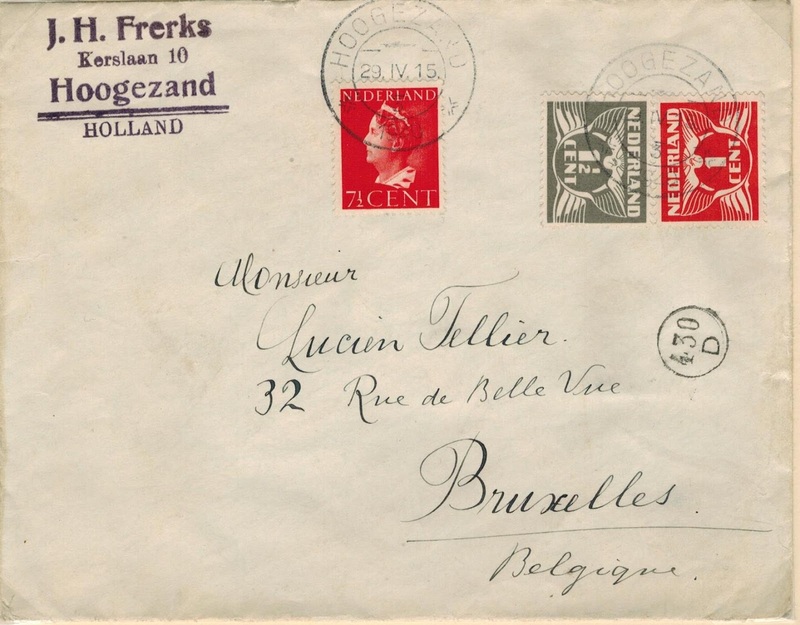 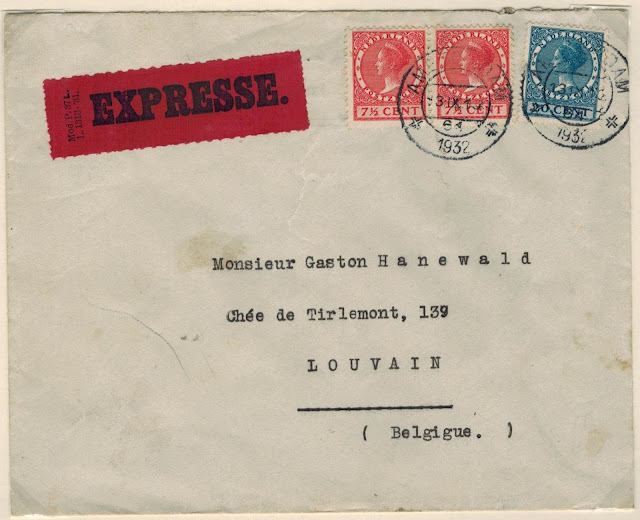 The 10 cent letter rate to Belgium was effective until September 30, 1957. 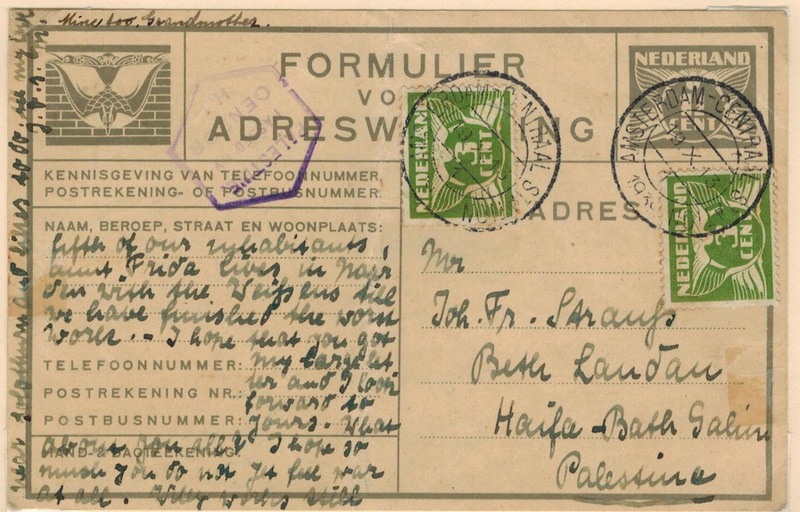 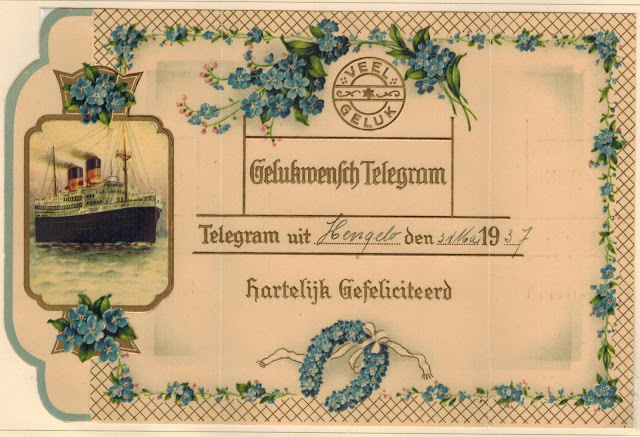 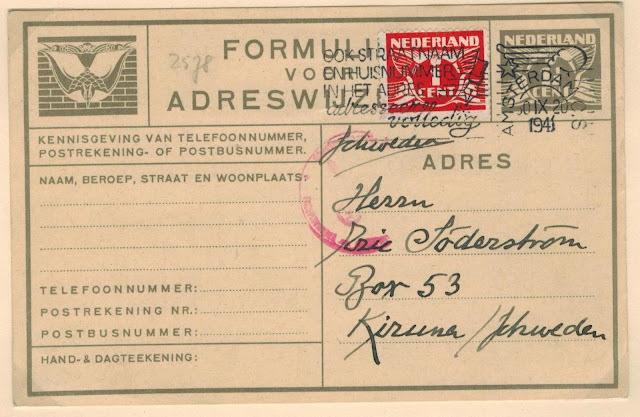 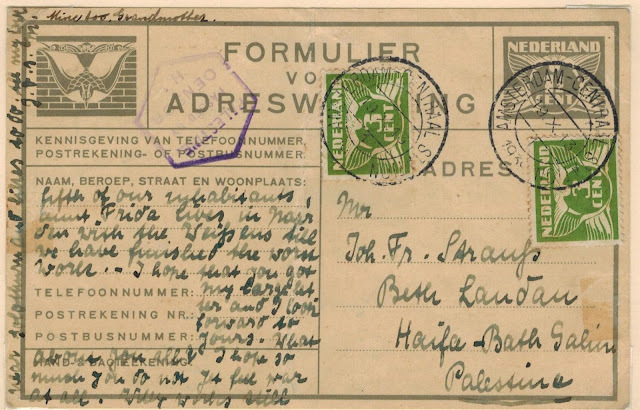 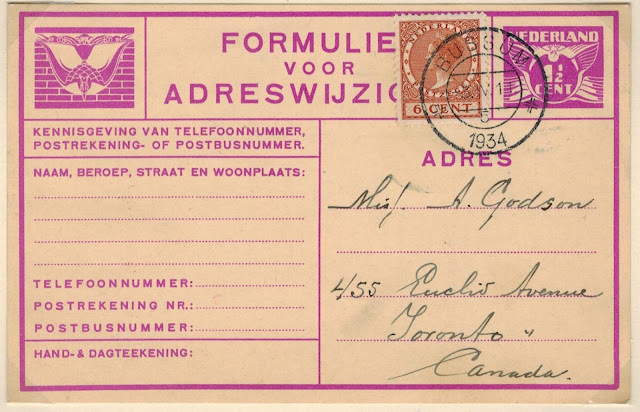 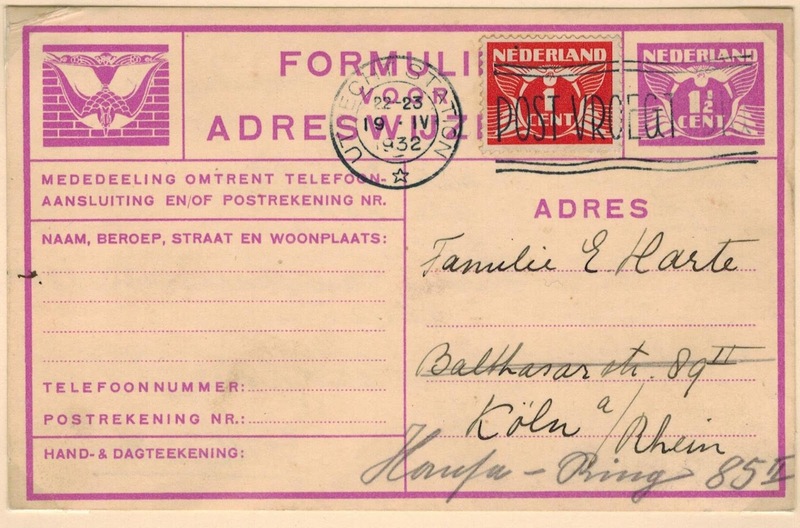 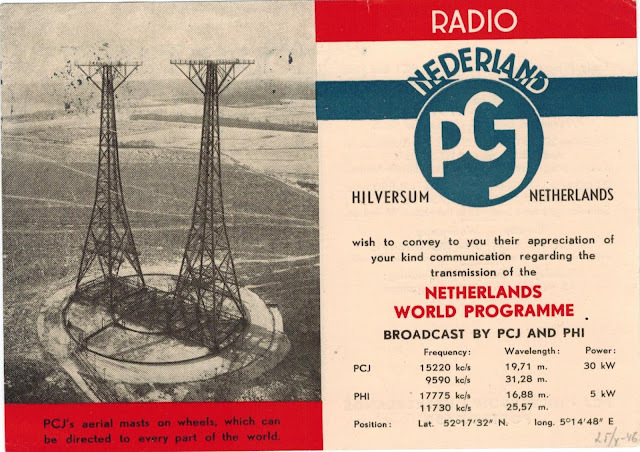 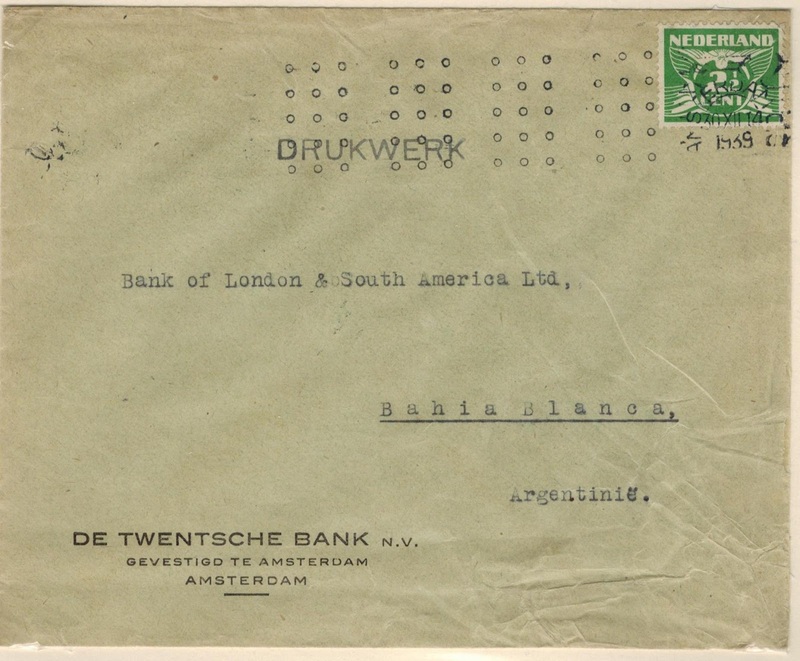 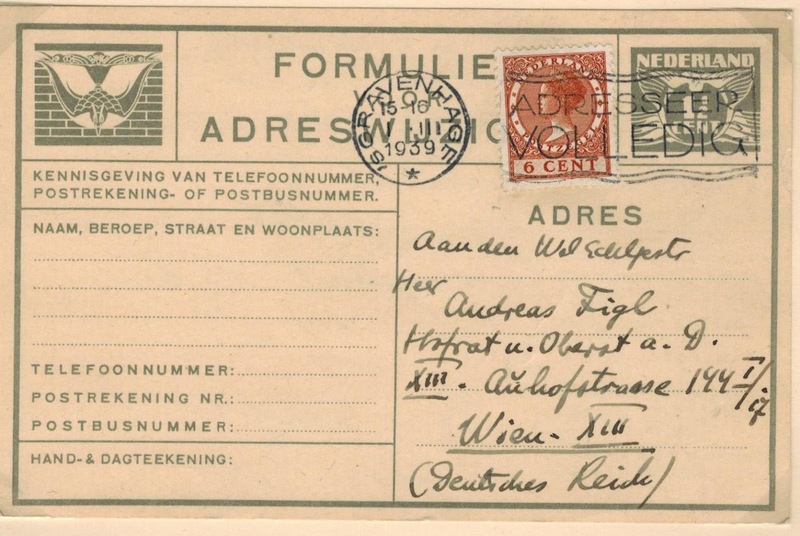 Domestic change of address cards were first issued by the Netherlands PTT in 1919. The change of address rate was the same as the first weight domestic printed matter rate. 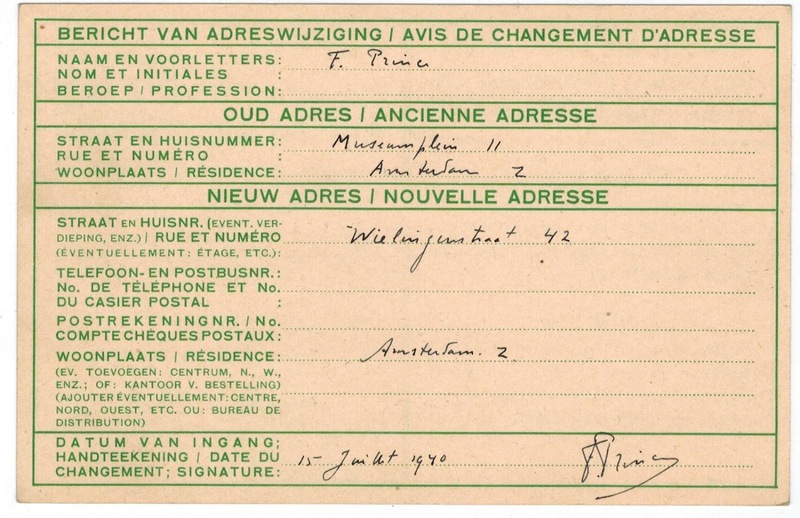 Domestic change of address cards were the subject of an earlier post. The domestic change of address cards could be sent to international destinations but had to be uprated, not to the international printed matter rate, but to the international post card rate. 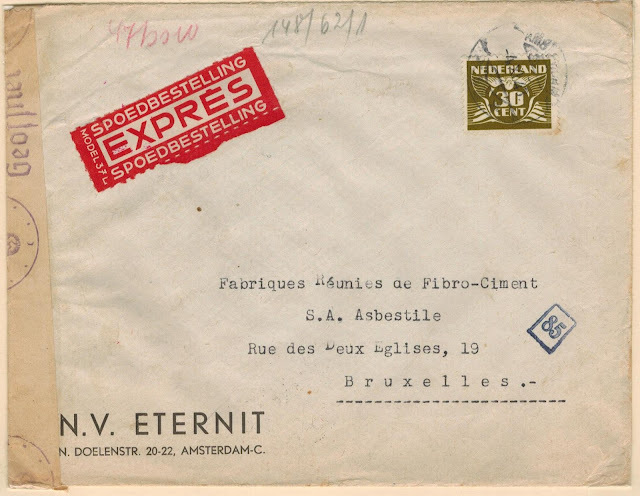 This was confusing and resulted in the underpayments shown in this post. 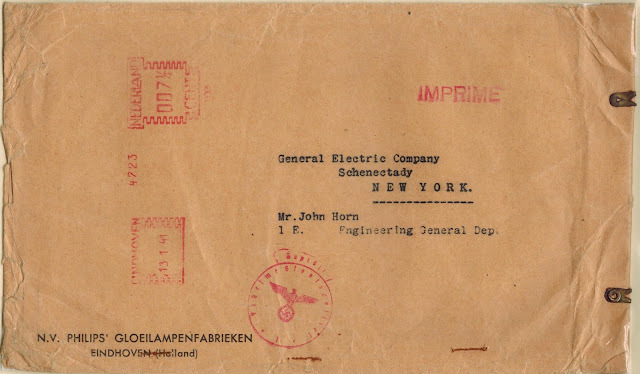 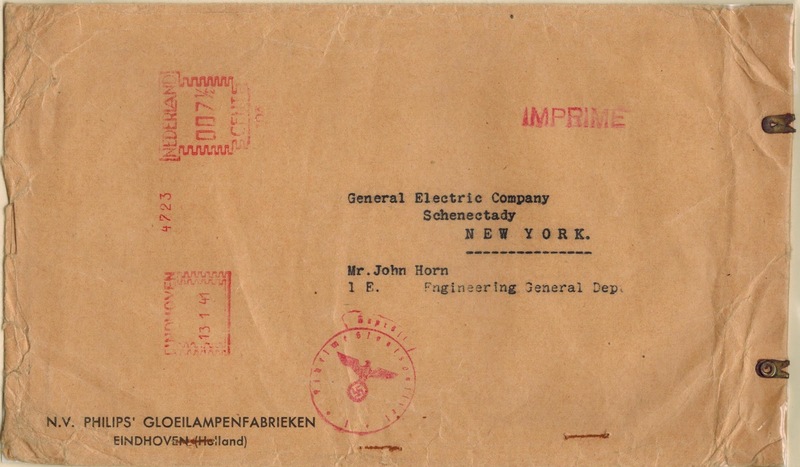 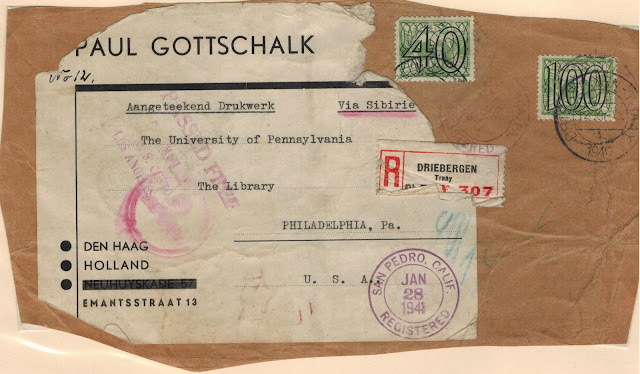 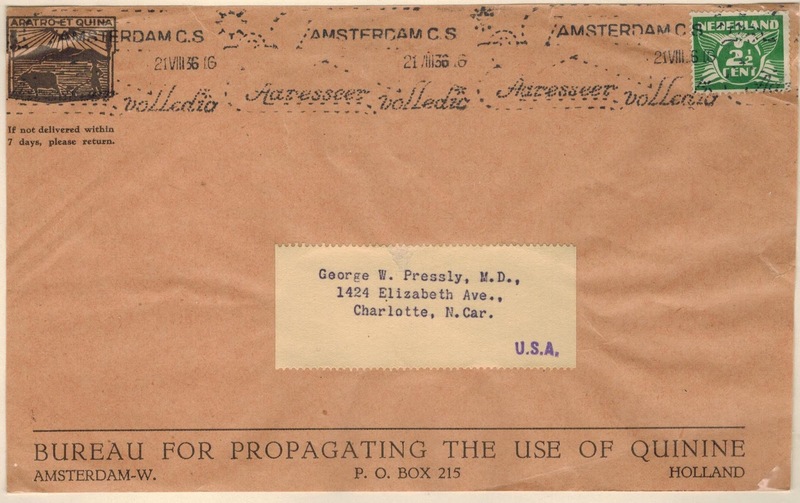 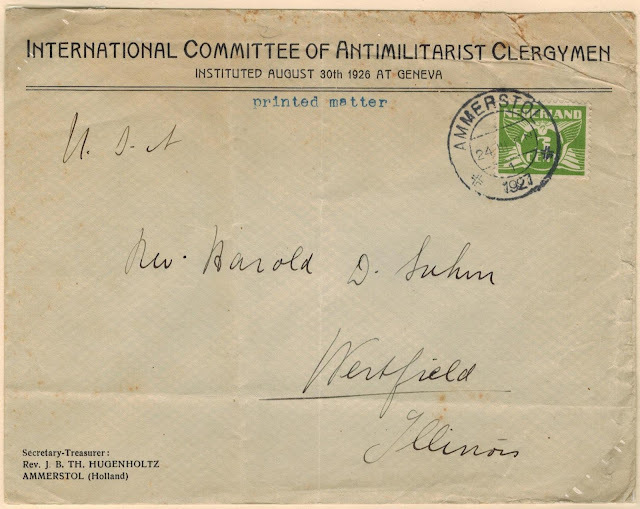 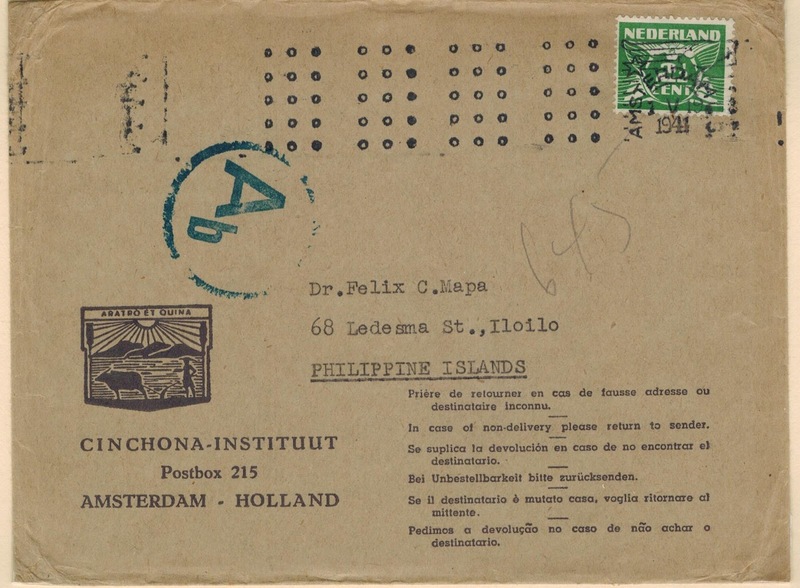 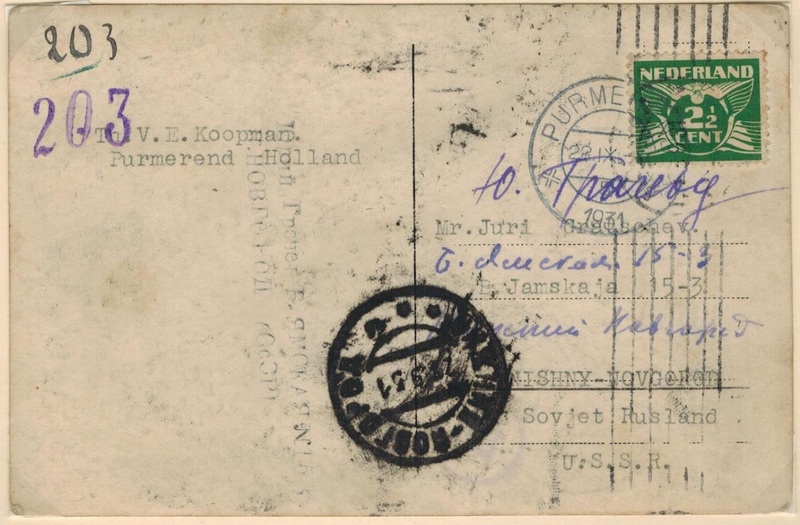 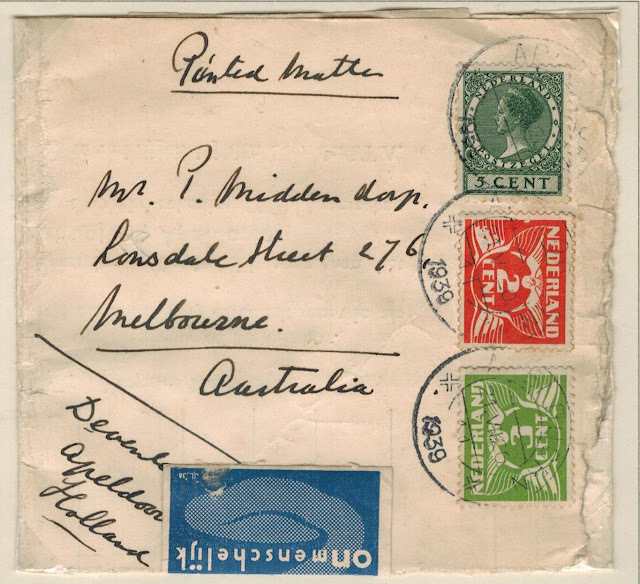 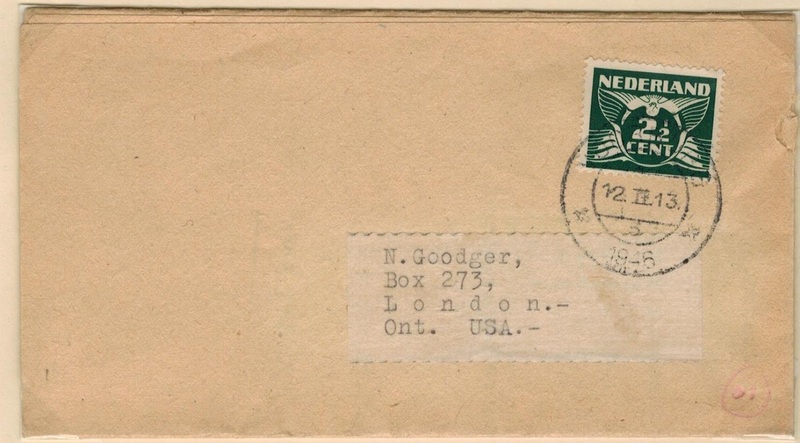 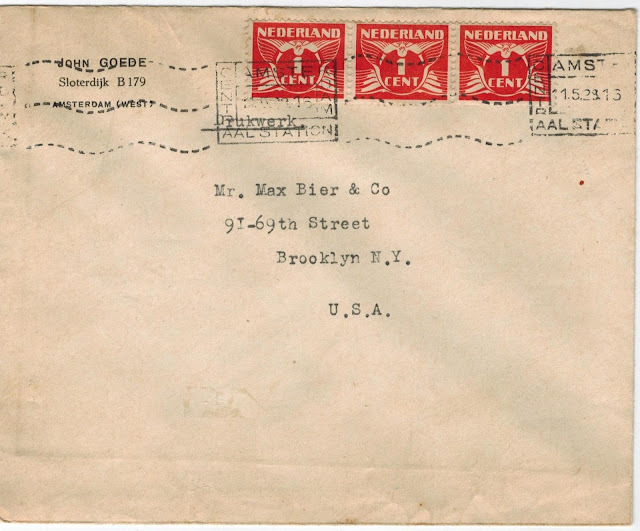 In 1940, the international change of address rate was decreased to the international printed matter rate with the release of the 2 1/2c international change of address card. 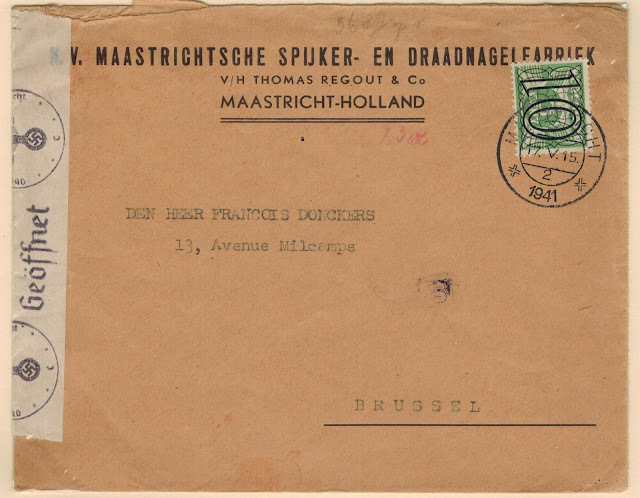 The 1 1/2c domestic cards could also be uprated to 2 1/2c for use to foreign destinations. 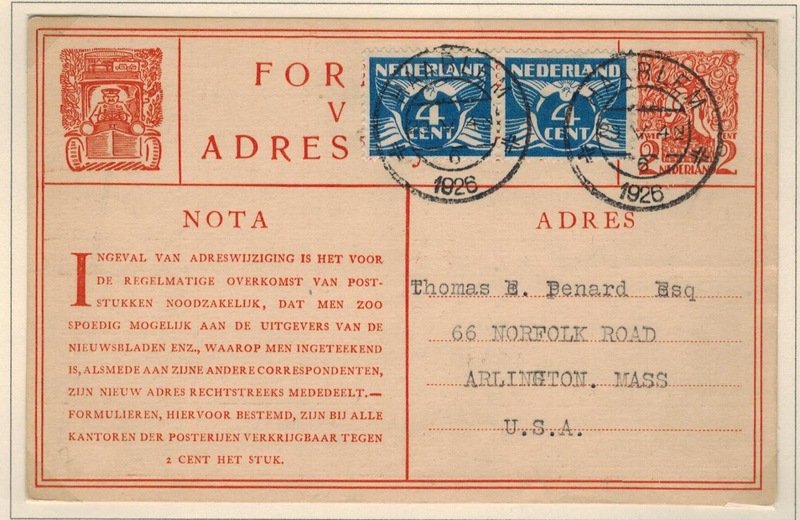 The international post card rate applied to domestic change of address cards mailed to foreign destinations. 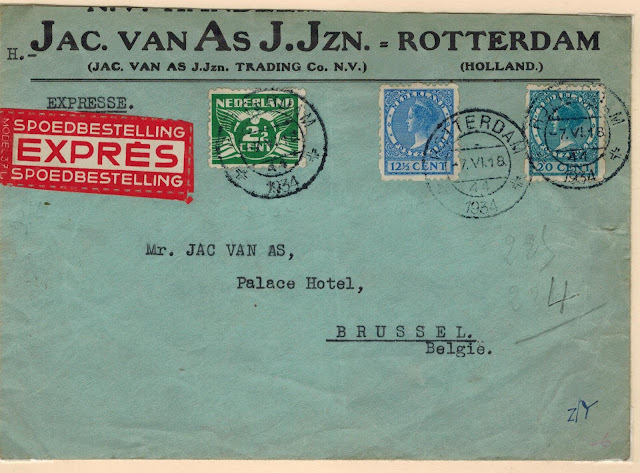 The 7 1/2 c international post card rate was charged for change of address cards mailed to foreign destinations. It's a pity to send this card without any words as the whole porto is wasted. 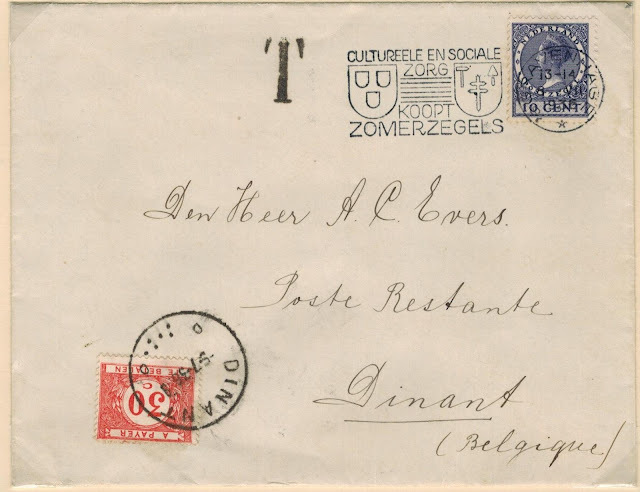 So I write these lines that we are in great health and that we four work closely together. 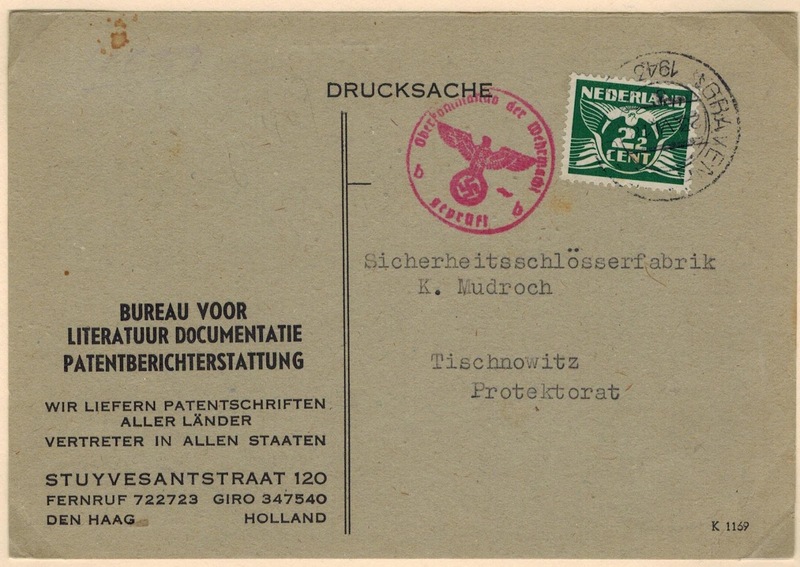 Both sides of the card were used for the message. 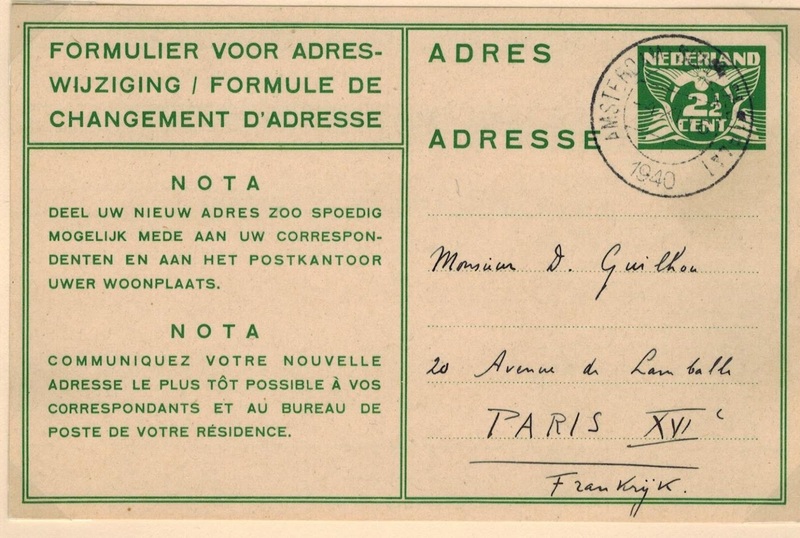 The first international change of address card was issued in 1940. 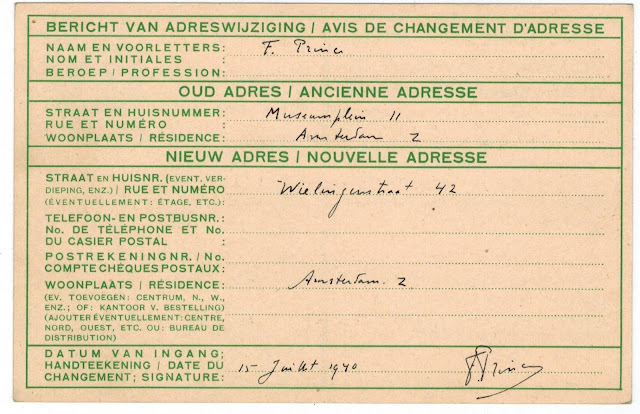 Domestic change of address cards could be uprated to 2 1/2c for use to foreign destinations. 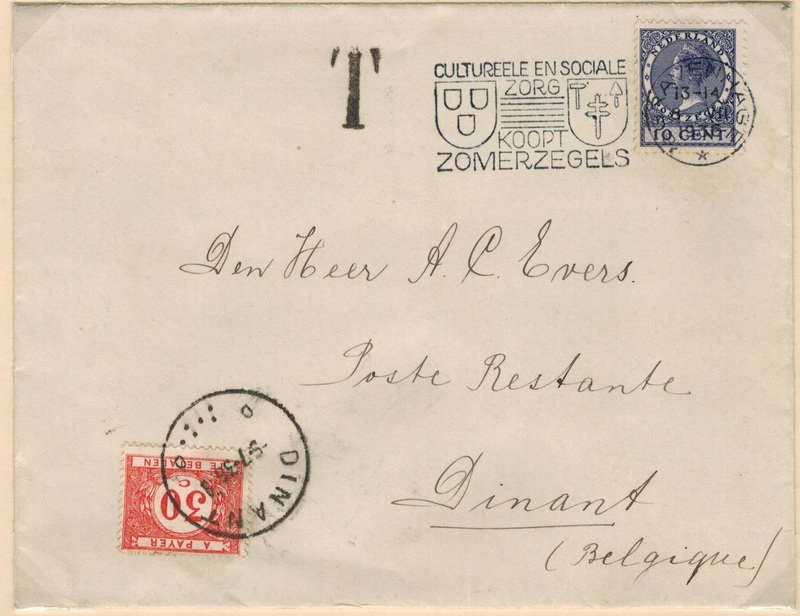 According to the Universal Postal Union regulations, printed papers were not to contain any personal correspondence and were to be made up in such a way as to allow their contents to be easily examined. 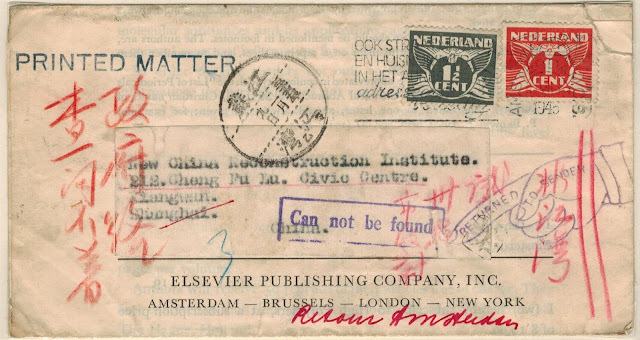 The international newspaper rates were the same as the printed matter rates. 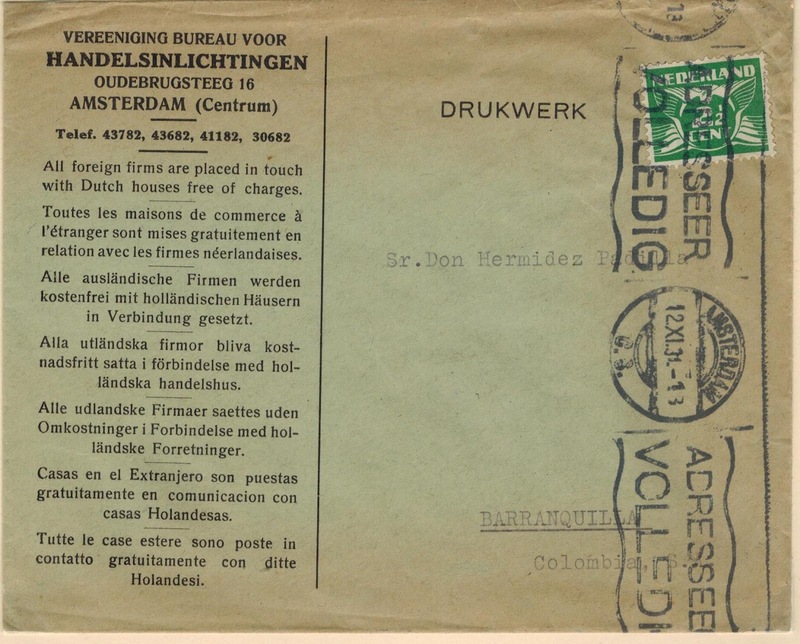 5c international newspaper rate for 50g. 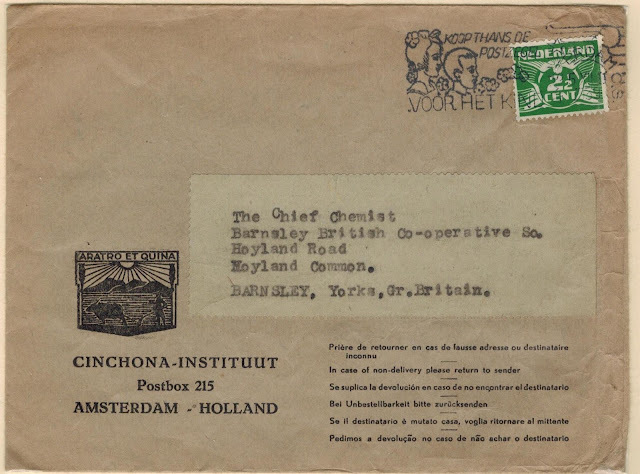 The international printed matter rate was reduced from 5c to 3c for each 50g. 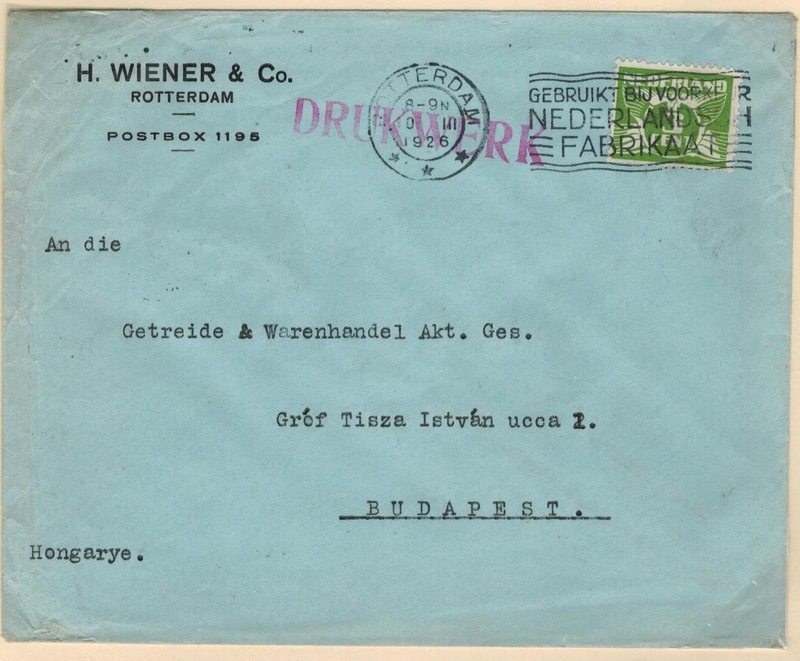 On March 12, 1938, Austria was annexed by Germany.